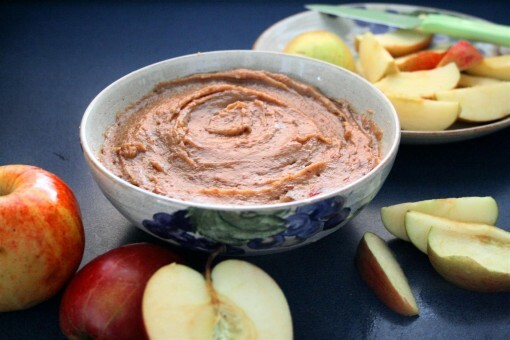 Caramel Apple Dip was posted on March 5th, 2011 and is filed under Dairy Free, Dips & Sauces, Gluten Free, Kid Friendly, Recipes, Snacks, Vegan. This entry has 20 comments. You can follow any responses through the RSS 2.0 Comment Feed. I have my own built-in philosophy which says that ‘healthy food should be yummy’. 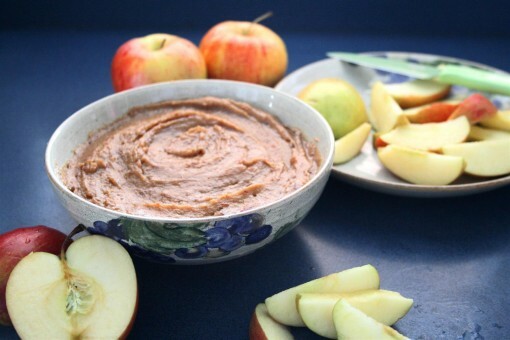 Meet the Caramel Apple Dip. Enough of the posts about detox and cleansing, let’s get to the tasty stuff. Actually, this is a very guilt free snack, even though it tastes sorta sinful. I’ve made this dip for years and it will always be a classic in my kitchen. It’s not just delicious; it’s actually good for you. I found a recipe similar to this on a raw forum website years ago, and tweaked and adapted it until it was what I wanted. Because of the tahini paste, this recipe is chock full of calcium, which is something I don’t get enough of. It also gives you some of your healthy fats for the day. This is the perfect after school snack for kids (and grownups!). Makes about 2 cups. If it’s still not sweet enough just add more maple syrup or dates. If it’s the desired taste, but still too thick, just thin it out with water or almond milk. Spoon it out into a bowl and enjoy…it’s as simple as that. Hope you enjoy it Rachel! It’s one of my favourite snacks! I’ve never seen an apple dip like this before–love it! 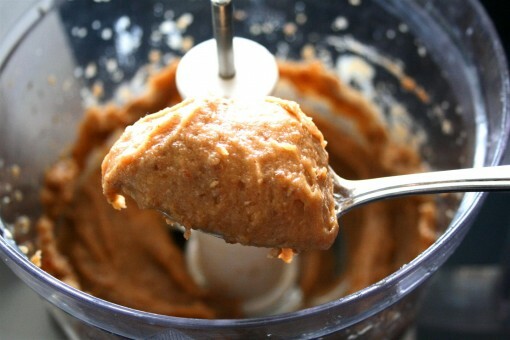 This caramel dip looks delicious! Nadia, I actually do not like tahini either…it’s just too bitter tasting to me. But in this recipe, it’s completely disguised and I love it! Tell me how your revised recipe works…I like new variations. Wow looks amazing. I’m going to try this tonight!! I just made an amazing vegan recipe too! I just started to blog so check it out! Omg you’re a genius. I would never come up with these things. Oh boy! This stuff is sooo amazing!! !